Ok, I am really not vain, just funny. Since I have been in a slump lately I thought I would do something to make me laugh. Well, I did it. I think this is pretty funny. I decided to make these for my friends that I meet at stamp mania in a couple weeks. I hope they think it's as funny as I do. 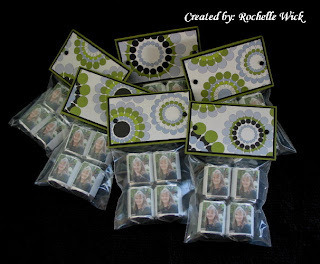 I printed my face on address labels and wrapped them around Hershey Nuggets. Here is a close up of me! Um... I mean the bag topper. Some other ideas you can do are print out your kids graduation picture and put them on nuggets and have them in a bowl at the grad party, wedding favors of the bride and groom. Babies first birthday's or any birthday. Or just print yourself and pass them out to your friends like I am doing. Ha ha ha. Good Times! I hope you all got a laugh today. I know I am still laughing. I made one of these for my friend a few years ago when she was expecting. I haven't had any other friends expecting until now. So I made this one for her. How fun is this card? I used to make gel cards all the time but I haven't made one in over a year. I think I will have to make some more. I totally forgot how much fun they are and how much people like to get them. Here are the directions for the gel cards on SCS. Here is what it looks like under the dress. The Turquoise paper is the card. It opens just like a regular card. The dress is on the front. Super cute ha? The "cleavage" is just a cut out triangle out of blush blossom that I glued onto the red. I do not have a template for this. But here is what you can do. Click on the picture of the outside of the card and print that out. Cut out the dress. 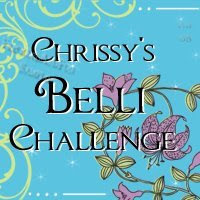 Trace that once on the color that you are going to use for the dress and once on blush blossom for the tummy. "My Embarrassing Day At The Gym"
Here is another card I am going to do in my class next Friday. I think I have posted this one before. Like I said the other day. I am casing myself for this class. I found the wood paper at Joann's. I love it. It really makes the card. I also doodled around the chicken to fill in the empty space. 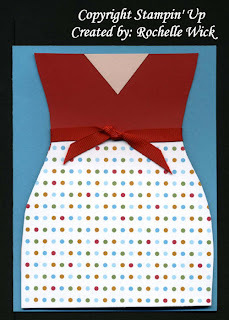 This card has a lot of pieces but it will be easy to make and shouldn't take much time at all. They will be making two of these. The bow is a separate piece of ribbon and then I glue dotted it to the wrapped around ribbon. Here is a link to a video on how to make the bunny ears bow. Mine got squished in the scanner a little. I love making these cause they are so perfect. I am kinda bow challenged. Wow! Two posts in one day. Woo Hoo! As I was getting my stuff together for my class in April, I noticed that 4 out of the 5 cards I came up with were birthday cards. I didn't plan it that way, it's just how it turned out. So I decided to use one of the other cards for my next class in June and made this one last night. I am going to give them the choice of greetings from warmest regards. They can use either the thinking of you, happy birthday, or the thank you. 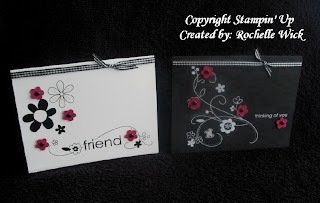 I am also going to give them the choice of using the flower stamp or the candle stamp from Tags and More. I didn't give them any choices for my first class. My hot brown guy is coming by today to bring me my order so I can finish prepping for my class. I didn't get anything fun for me this time. Boo! I think my next order will have at least one stamp set for me. I feel like I am always ordering things that I "need" instead of things that I want. "Egg Roll & Dining Room Table"
Here is my new "stamping room" Ha ha ha. My old table was here before we got the new one and it wasn't against the wall so I had some stamping stuff behind the table. Now I can't really do that anymore. I will figure out something though. I have most of my stamping stuff in tubs to the right of the table in a built in cubbie. Our house is small (1500 sq ft) so it is hard to find space. 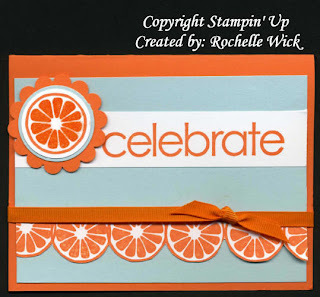 When we move back to MN (or anywhere else) I am getting my own space for stamping. I just have to figure out what works best for me right now. When we lived in MN we had a 4 level 2400 sq ft house with a basement. So it is a big change for us to have a small house. I can't really keep much in the garage cause that is our "basement" When we moved here we had a rummage sale and had to sell about half of what we owned cause it didn't fit in the house. So the garage is our storage room. I keep about 4 tubs out there with paper and stuff that won't get damaged by the heat and humidity. A lot of you asked how our egg roll went this year. Thanks for asking. We had a great time. Here are the girls rolling eggs. We propped the ramp on a folding chair and let the eggs roll. We rolled 4 eggs down first so they would have something to aim for. Good Times. Our ramp this year was an old shelf. Good thing we got the new table because this shelf was on the wall by the old table and I didn't have anything else in the garage to use as a ramp. I can remember some years growing up when my dad would grab a big cardboard box from the garage and it would have a big oil stain on it cause it was under the car. LOL Now he has a "special" ramp that they use every year. Our shelf worked great through. Molly was the big winner this year. She won all three games. They had such a blast. They wanted to do it all day. Seriously, if you guys don't do this, you should try it. The parents have as much fun as the kids. Here are my girls on Easter. The weather was perfect. Check out our new fence behind the girls. This one isn't going to blow down in any storm. So the next time I get into a funk, someone yell at me and tell me to go shopping. I guess retail therapy really works. Today I am going to get my sample card done for my class since I now have the sheer ribbon and try to come up with one more card for my class. Here are two cards I came up with last night when the kids went to bed. I didn't get the summer picnic SU paper that everyone is using with the tart and tangy stamps so I found my own cherry paper. I inked up the stamps with markers and then went over them with the markers cause they weren't dark enough for me. I think these cards are cute. The greetings are Hero Arts. They come in a three pack called Sunny Messages. The third stamp is thinking of you. Thanks again you guys. I am so lucky that I have a support team like you. I know that I have been MIA since Easter. I don't know what is wrong with me. I swear ever since we got a new dining room table, I haven't been able to stamp as frequently as I would like. I do not have a stamping room so before we got the new table, I would keep some of my stuff behind the table and the rest of my stuff in tubs a built in cubbie next to my table so I could just grab some stuff and stamp. Now we have a pub style table, which is a high table and it is bigger than our other one. This one is a giant square that is pushed up against the wall. So I can't keep my stuff in the open, I have to have it all in the tubs and it is a hassle to take it out. I feel like I have lost my mojo again. I am trying to get my stuff together for my stamp class April 4th. I have 3 out of the 5 cards prepped but I am still trying to come up with another card. I haven't posted them because some of them I have posted before. I guess I am casing my own stuff this time. I am also trying to figure out what to do for stamp mania. I like to do a 3D item instead of a card for the shoebox swap. This year they want all 3D projects approved prior to the stamp mania. I got my first project rejected. Which makes me kinda mad. Apparently they want the 3D projects to have as many supplies as if you were making a card. My thought is if you are going to approve the projects then you should approve the cards too. Sorry, I am a little bitter on this one. This is my 4th stamp mania and we never had to get a project approved before. One year I did a wrapped Hershey bar, the next year I did a covered 3 x 5 notepad and I threw in a beaded pen, last year I did a shaker magnet. This year I wanted to make the gum holders. I think they are so cute. But I got shot down. It wasn't big enough and didn't use enough supplies. So I decided on doing the pull up m&m holders. That got approved but now that I think about it, that project actually is more supplies than a card plus each one uses 24 inches of ribbon. I don't know if I want to do that one anymore. The shoebox swap is for 10 people plus your sample, 4 extra ones for the people running the event and extras for people that might make a mistake. 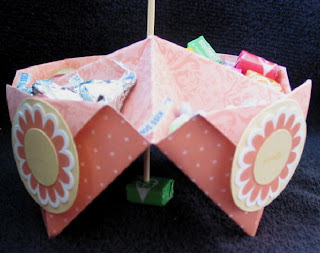 I do have my shoebox swap all prepped but I might change my mind and do a wrapped Hershey Bar instead. Last night I thought maybe I would do a card holder. I want to use the tart and tangy set. I don't have a lot of current SU stamps so it is hard for me to come up with something cute with what I have. So I made two different samples of card holders last night. One was orange and bashful blue and the other one was orange and red. They both looked hideous. So if I can't think of anything fun to do I guess I will have to do the m&m holder. Sorry I am rambling. AGH!!! Ok, I am going to pull myself together here. I have been tagged by Marie over at The Perky Pomegranate. 7 random things about me. 7. I am a gamer. I LOVE video games! I would like to tag the following people. Happy Easter everyone. I am going to take the day off to spend it with my family. Saturday we went to the park for the "eggstravaganza" The kids had a blast. They met the Easter Bunny, did the egg hunt, played games, and did the petting zoo. The adults had fun too. It was a beautiful day. After that we went out to lunch and then went home to color eggs. Fun fun fun. We will be doing the "egg roll" on Easter. I don't know who is more "eggcited", me or the girls. LOL So, I hope you all have a great day with your family. Happy Easter!! You asked for it. Here it is!!! 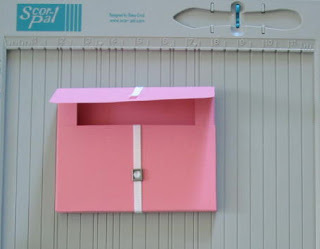 This is a tutorial for the card holder using the Scor-Pal. 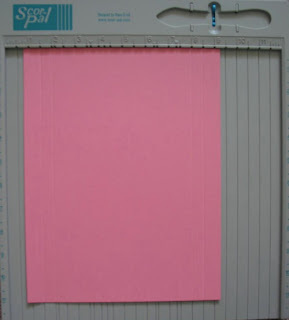 If you do not have one I will also give you the measurements for the Fiskers Cutter which is what I used before I got the Scor-Pal. Printable directions are at the bottom of this post. 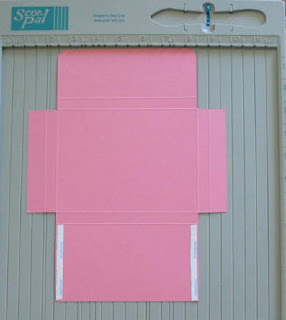 Step 9: Cut inches 11 ½ inches of Ribbon and adhere to the center inside of the card holder and wrap around back and adhere to front flap. I use Glue lines to secure ribbon. 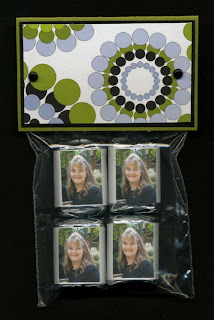 Step 10: Adhere mat and stamped image to front flap and add Velcro dot to close card holder. Depending on the thickness of the cards, this card holder will hold 6 cards with envelopes. If you can not open these in PDF form, shoot me an e-mail and I will send it to you in a word document. Let me know if you want the Scor-Pal directions or the Fiskers Cutter directions. 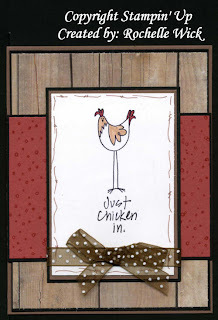 I am thinking about doing this card for my upcoming class. What do you think? I really like the card a lot. I was inspired by a couple of cards on SCS. They will be making two of them. I just don't want it to be too time consuming. I used the stamp-a-ma-jig for the presents and markers on the greeting. Those would be the time consuming parts. So far the other cards I am doing aren't very intense so I think this will be ok. Maybe I worry for nothing. But just out of curiosity, do you think it is a good card for the class? I saw this tutorial on SCS and thought they would be fun to make. I need to do make something. I am going through withdrawals. My kids are off track until April 7 and I don't have a class or teachers to make Easter treats for. For those of you who don't know what off track is. In California, the kids go to school all year long. They go for three months and then have a month off, then go for three months and have a month off and so on. Well since we are off for Easter this year, I don't have anyone to make treats for. I showed the tutorial for these to my neighbor and told her that we should make these sometime. She bought me a bag of chocolate bunnies the next day so I could make them. So I decided to make these for her family. They are easy to make. You can get two from one piece of paper. Mine are being held together with the ribbon. I didn't get to stamp Saturday because my little Sarah was real sick. She has a cold and had a fever of over 100. I was up with her all last night with her fever reaching 103. She is feeling better today, her fever is down to 100 and she is resting. So I am going to do a little Q and A. Someone asked what adhesive I use. I use Scotch Quick Dry Tacky Adhesive. I love this stuff. I have used it for almost two years exclusively. I honestly can't remember the last time I used a tape runner. (with the exception of stamp camp) You want to put a small line around the edge of the paper and you have about 5 seconds to get it where you want it. 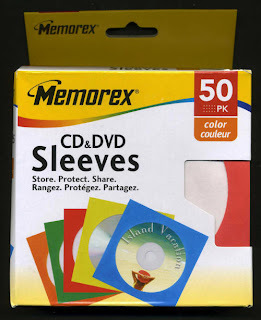 It dries super fast and your cards will never fall apart. You can use it on glass, metal, cork, paper. You can use it on practically anything. I get it at Target in the scrapbooking isle. A 2oz bottle will last me at 3 months. They sell a 4oz bottle at Michael's. The ONLY downfall about this glue is that it makes the cards very stiff. But that is it. I can deal with that. Another question: How do you keep so much chocolate in the house and not eat it? I will tell you how. I am not a chocolate lover. I like it but I do not have to have it. I like salty way better than sweet. Give me a bag of chips and I am super happy. That's why I don't make wrapped potato chip holders. I would end up wrapping just the bag wrapper. And that's not fun to give away an empty bag of chips. LOL Although I do have a problem with the Hershey cherry cordial kisses. I will eat a whole bag of those. But that is the only chocolate that I can't control myself with. I have bags of candy sitting about three feet from my stamping area and I don't even notice it. 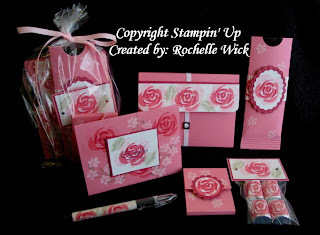 If you have any questions about stamping produts or supplies that I use or what ever, feel free to shoot me an e-mail or put it in a comment and I would be happy to answer your questions. I hope you all have a great day. I hope to stamp later today. I got some new stamps and paper yesterday. 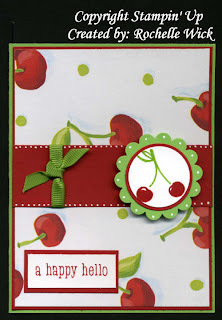 Another scratch-n-sniff card we made in stamp camp. This was inspired by a couple different cards on scs. Directions for the scratch-n-sniff card found here. I like the oranges as a scallop border even if mine are a little crooked. 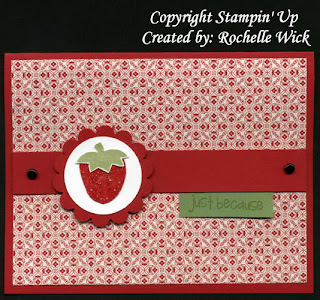 I am picking up my tart and tangy set today from my demo and I am going to stamp tonight. I am also getting some sale-a-bration sets and paper and striped ribbon. 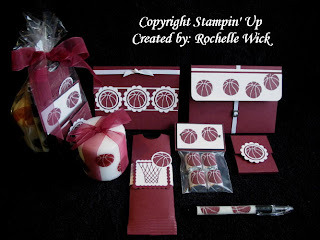 I need to start preparing for my parks and rec stamp class in April. I have one card prepped and another almost prepped. Still working on some ideas. I am seriously addicted to making these. They are super easy and super fun and super fast to make. I saw them on someones blog and knew I had to make them. For the life of me I can't remember where I saw them to give them credit. I always put their name and blog address on the directions when I copy them but I didn't do that this time cause her name was watermarked on the photo, which I can't read. Anyway. I started out making three because there are 9 Hershey Sticks that come in a pack. Then 3 turned into 6 and 6 into 10. I don't know if I can stop. I got the Hershey Sticks at Target. They are $1.99 per pack but for some reason (and it wasn't cause they were expired) the regular ones were on clearance for $1.38 So I bought a bunch. They are great for just having around for something quick to give some one. In fact my daughter wanted a birthday card to bring to school for her friend who has a birthday this weekend. So I found a card and gave her one of these. Perfect. The greeting stamp is from Hero Arts and I picked the one that says Just Because. Then I can give them out, just because. Here is the side view of them so you can see what they look like. I am also posting the directions and photo of how I made them so you can get addicted too. You don't need double sided paper because I think they pretty much have to rip them open to get to the candy. Unless you close them with ribbon. You can find the Hershey Sitcks at the grocery store, Target, Walmart or Walgreens. Here is what the box looks like. They also have carmel, Mint, Dark. There are also other brands like Butterfinger and Nestle Crunch. I usually see them on the top shelf at the stores. I finally finished this gift set. Whew!! I have to say that this was the hardest gift set I have made. I love how it turned out but man, it was tough. I am making it for Sara's daughter. Her school colors are maroon and white. That's it. Just the two colors. That's what made it hard. I tried to find some pattern paper that I could use but I never found the right color. It is pretty cute though. I hope she likes it. Sara's daughter plays basketball but has a knee injury right now. I was only supposed to make the one set but it was taking me so dang long to do it I decided to make two so Sara's daughter can give one to a friend if she wants. I only made one card holder though but two of everything else. I also left the cards blank so she can stamp what ever greeting she wants when she is ready to give them away. I don't own these stamps either. Sara was kind enough to borrow them to me. I feel bad, I have had them since before Christmas. Thanks Sara. Here is a funny story. So my parents are here and yesterday was their last day so they decided to go for another walk in the sunshine before they go back to the snow in MN. 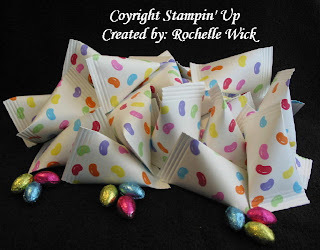 I needed to make some kind of treat for them to bring back to my nephew for his pre-school class for Easter. I decided to make sour cream containers while they went on their "little walk around the block". They left at 10:30 and I got started. I didn't realize that they were gone as long as they were until my girls asked for lunch at noon. I made lunch and went outside to see if I could see them walking home but no parents in sight. I was just getting ready to get in the car and go look for them and they came in. Tired, hot and sweaty, and laughing. Their "little walk" took them 7 miles. They got a little bit lost and by passed several roads to get to our house. No money and no phone. I lectured them when they got home on taking a phone with them or money for a pay phone like they gave me when I was younger. I told them that next time they want to go for a walk I would pin our address and phone number on their shirts with a note that said, "If lost, please return to...." Just like we do for the kids on field trips. It was kinda funny. I didn't make these too fancy and nothing to original either since I made the same ones for my daughters pre-school class only I added ribbon. Here are the directions to make these cute little treats. Super easy too. I used Scor-Tape to secure mine. I love that stuff. 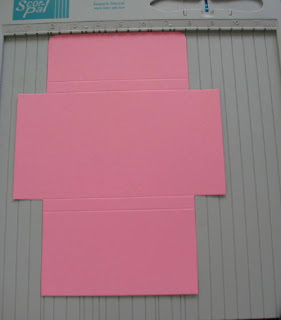 It is a premium double sided adhesive, best on the market, acid free, heat resistant and incredibly sticky tape. 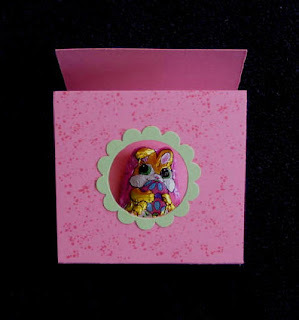 It can be used with embossing powders, foils, beads, glitter, ribbon etc. 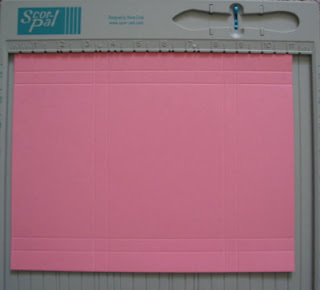 Also it is 27 yards long compared to Stampin' Up's 10 yards long and $2.45 cheaper. Go on over and see Diana and get yourself some of this awesome tape! Tell her I sent you. "Roses in Winter Gift Sets"
My parents are leaving today so I had to get these done so my mom could take them back with her. She is giving them to her two friends that threw her retirement party. I finished them up this morning. Nothing like waiting until the last minute ha? By now you all know that this is my favorite gift set to make. I could make this one every day. I love the colors and the stamps. I don't know if you can see the glitter but there is stickles on all the roses and in the center of all the white flowers. It is so pretty. The card holder holds 6 cards plus envelopes. I put three birthday cards and three thinking of you cards inside. The other items are a, RSVP Pen, gum holder, Wrapped Hershey Bar. Click on the highlighted ones for directions. I will be doing a tutorial for the card holder very soon. Stay Tuned. My parents are visiting us for a week so I don't have anything to post today. I will be finishing up two gift sets that my mom wants me to make and I will also be making some kind of candy holder for my mom to take back to MN for my nephew's pre school class for Easter so I will have something soon. Also, I am such a DORK!!! My daughter was looking at the chipboard card I posted yesterday and she was like. Did you notice that you put the U and the 2 backwards on your card? I was like, What? so when I looked at it I noticed that It says Birthday hugs and wishes U 2 instead of Birthday hugs and wishes 2 U. LOL oh well. I guess I will have to flip that 2 to the other side of the U. AGH!!! 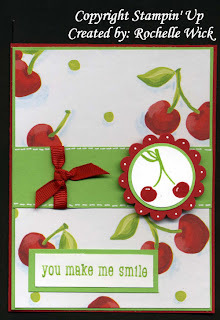 Here is another card we made in stamp camp. It's the first time I really worked with chipboard. It is pretty fun and I enjoyed it so I can't wait to work with it again. 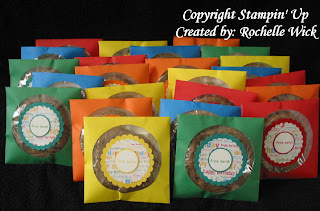 I don't have any Stampin' UP chipboard but I do have some flowers that I have had forever but never used so I guess I will have to break those out and see what I can do with them. We used craft ink to color these. Looks like I didn't get enough ink on the bottom of this one. 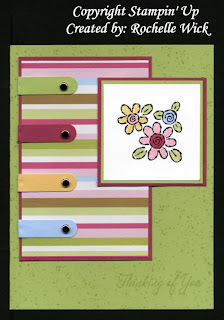 I made two other cards with the chipboard but didn't get them finished so when I get them put together, I will share. Have you ever done a scratch-n-sniff card? They are pretty neat. 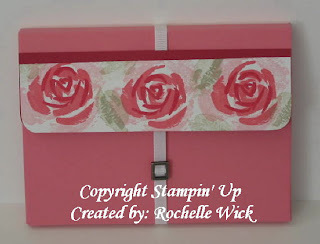 I haven't done one -in a while so it was fun to make some in stamp camp. We made 5 different scratch-n-sniff cards. I didn't get all mine finished though. We had 11 projects and I must have been too busy chatting, I didn't get all my work done. I did stamp everything, I just have pieces of a bunch of cards. So when I get them put together, I will share them with you. For the strawberry, I stamped the berry in red and then again in wasabi. I embossed the berry with the mix then cut out the wasabi top and adhered it to the berry. 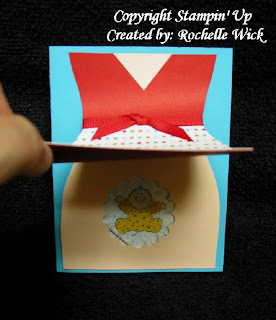 Here are the directions how to make the mix and make the card. 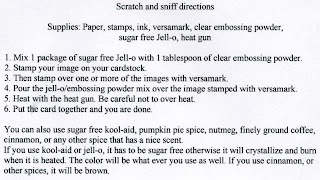 If you are using something other than sugar free Jello, the mix you would use is 1/2 tsp spice and 1 tsp Clear embossing powder. Here are the two rub on cards I made at stamp camp. They were really hard to photograph. I scanned them first and white one was great but the black one didn't scan well at all so I took a picture of them. These were really fun to make. We used the three for you punch for the flowers. We could use any color we wanted to for an accent. I picked rose red because I liked how it went with the black. I think I will have to do more things with rub ons. They are pretty cool. Accessories: Rub On's, Three For You Punch, Black Brads, Black and White Gingham Ribbon. So, I tried rub-ons for the first time at stamp camp last weekend. Can you say FUN!!! I didn't want to stop. 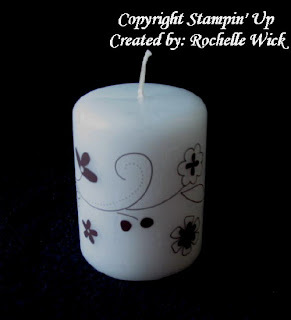 We made two cards with rub ons (which I will share tomorrow) and I rubbed on a Starbucks Frap bottle, and this candle. Let me tell you, I thought I would never try them, I didn't think they would look cool and they would be too much work. I was wrong. They do look cool and they aren't too much work. They are super easy. Now I wish I would have got some with my sale-a-bration stuff. I guess I will just have to buy some now. Have you ordered your Scor-Tote yet? I just got mine yesterday and I love it!!! It has a big pocket for my Scor-Pal and two deep pockets inside. One fits my Fiskers Cutter perfectly and I haven't decided what to put in the other one yet. But I can put just about anything in there. 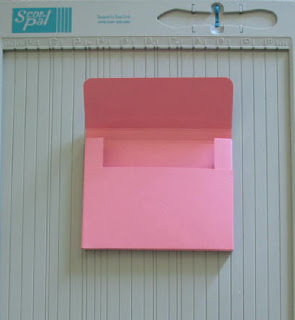 There is also room for paper in case you are taking it scraping or stamping. Plus it has another pocket in the front. And it is totally waterproof, not that I am going to take it swimming.....but if I did, I wouldn't have to worry about it. LOL So if you have a Scor-Pal you need to get your self a Scor-Tote. If you don't have a Scor-Pal, WHY NOT!! Tell them that I sent ya! Remember cootie catchers from when you were a kid? We made these at my stamp camp last weekend. Super cute, am I right? These are so fun. We used a whole 12 x 12 sheet of paper. You can use any size as long as it is square. I am going to use this for the centerpiece on my table. I know I will have to refill the candy though. The kids are all ready taking candy when I am not looking. I stamped the chick in black on saffron paper and then on white paper. 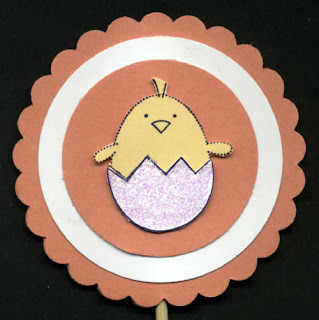 I cut out the egg from the white paper and put it on the chick and added stickles to give it a little bling. The stick kept falling over so we stuck it through a starburst to keep it standing tall. I bet Martha Stewart didn't think of this. 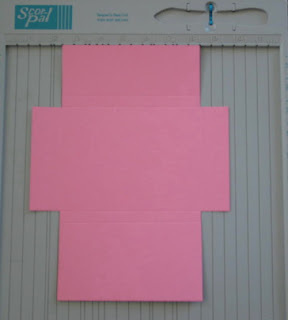 After step 3 flip the paper over and continue from there. Martha didn't tell you that part. I think she just wants to keep it all to herself. Have you ever heard of Amish Friendship Bread? I had never heard of it until last Saturday. My demo gave me a small loaf of banana bread last Saturday morning. It was soooooo good. We had stamp camp later that afternoon and she gave me a gallon size zip loc bag with some white goo inside (which is the starter mix) along with a recipe for Amish Friendship Bread. When we were talking about it and as I was reading the directions for the bread, I almost got sick. (not literally) The idea of the bread is that you make a batch and then take out three cups of "starter mix" and give them to three friends along with the recipe for the bread. Then they make the mix and pass it on to their friends and so on. Here is the problem. The starter mix has milk in it and it sits on your counter for a week before you make the bread. Also the starter mix I got from her, she got from someone else, who got it from someone else, who got it from someone else and so on. Who knows how long this starter mix has been going around. Doesn't that sound not safe? But the bread was so good. 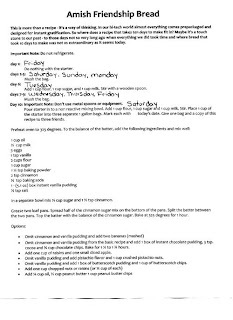 I am on day 6 today so I am going to add more milk and stuff and then keep it on the counter until I make the bread on Saturday. I think it is very weird and unsafe, although the bread was super delicious. I am going to follow through on this, I know it is safe cause I didn't get sick and if the Amish do it, it has to be good right? My challenge to you is for you to do it and let me know how it turns out for you. 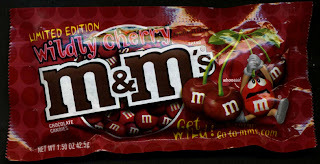 Also, have you tried the new M&M's? Dang it that they are a limited edition. They are DELICIOUS!! I am a sucker for anything cherry too. "Got Milk? We've Got Cookies"
Sunday was Sarah's 7th birthday. Since it was on a Sunday she brought treats to school today. She is my one that doesn't like cupcakes. Loves cake but cupcakes are out of the question. I haven't figured that one out yet. Anyway, I had made these for her Kindergarten class last year and she wanted them again this year. I bought the giant cookies at the grocery store and wrapped them in saran wrap and put a napkin in the holder as well. The from Sarah greeting I printed from the computer in SU's colors. The birthday paper is from the DCWV Summer Stack from last year. I got the CD/DVD holders at Walmart. They come in so called "bold" colors. A couple of the colors are just a little off from SU but the kids don't care. 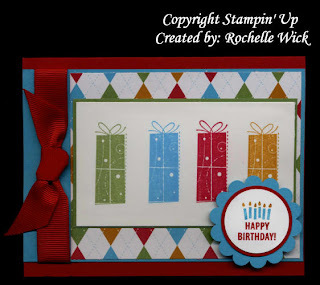 "Super Cute Birthday Fence Cards"
Here are a couple birthday cards we made in stamp camp. I can't believe it was our last one for this year. Dang that 7 months sure went fast. I am bummed about that. I really enjoy stamp camp. Our demo went a little crazy this time. We had 11 projects. Yeah 11. It was a lot to do but they were all such fun stuff. I can't wait to share them with you. 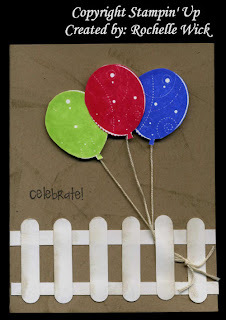 For this card, we did direct to paper on the background and how about that word window fence. Is that cute or what? The Balloon's are cut out and popped up with foam dots. 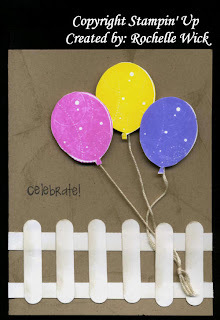 The greeting is from the set Just Celebrate from the Occasions Mini Catalog. The fence was also sponged in gray to soften it up.